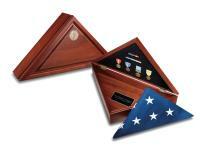 Create Lasting Memories for those who served our country with a beautiful American Made Flag Case. Preserving your Veteran's Burial Flag, military decorations, and family history for future generations will know who they are, when they understand the story of where they have been. The ultimate Tribute. Made in America by Americans and for Americans!